"We try to always live up to the name and not off of it. Myself and the design team make sure she would be proud of each product." It’s been just less than a week since the news of design matriarch Florence Knoll’s passing at age 101. Knoll, who prophetically pushed American design toward modernity, pioneered new ways of thinking about how we conceive, furnish, and exist in both our homes and office spaces. 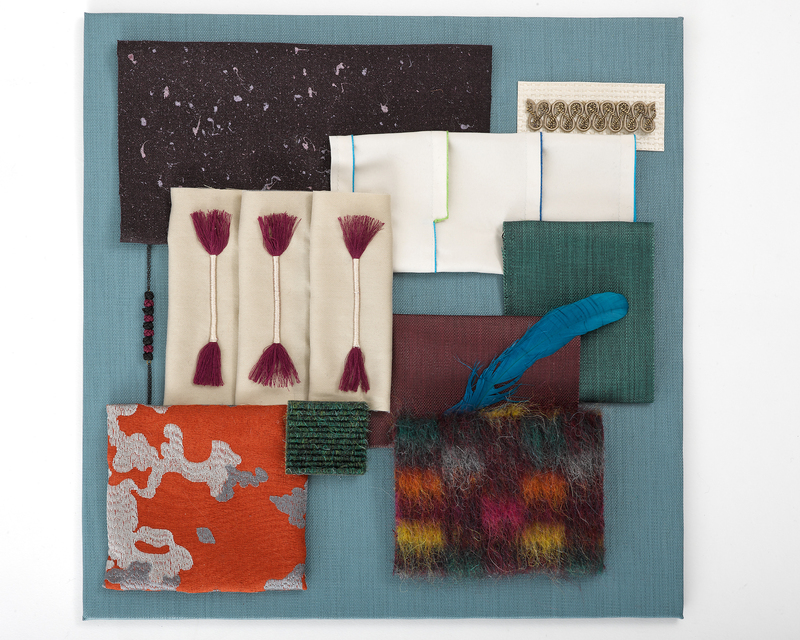 Her indelible mark on the industry is ubiquitous and, perhaps, manifests most strongly in KnollTextiles, the line she founded at her husband Hans Knoll’s namesake company. The firm continues to provide services related to design, textiles, and furniture manufacturing to this day. 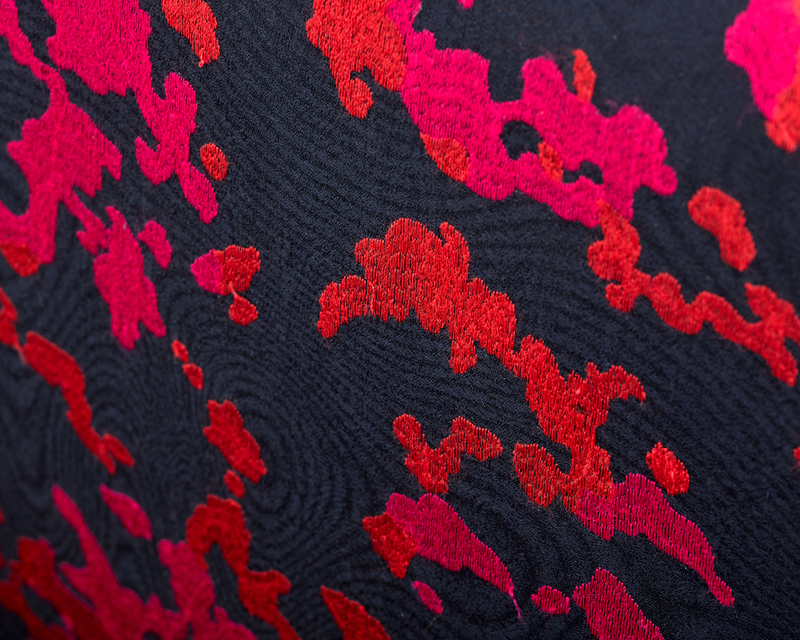 KnollTextiles, the arm of the company responsible for crafting fabrics, has just celebrated the 10th anniversary of its Luxe imprint, which crafts luxury finishes and upholstery. To mark this occasion, Surface spoke with Dorothy Cosonas, who serves as the creative director for KnollTextiles and Knoll Luxe. 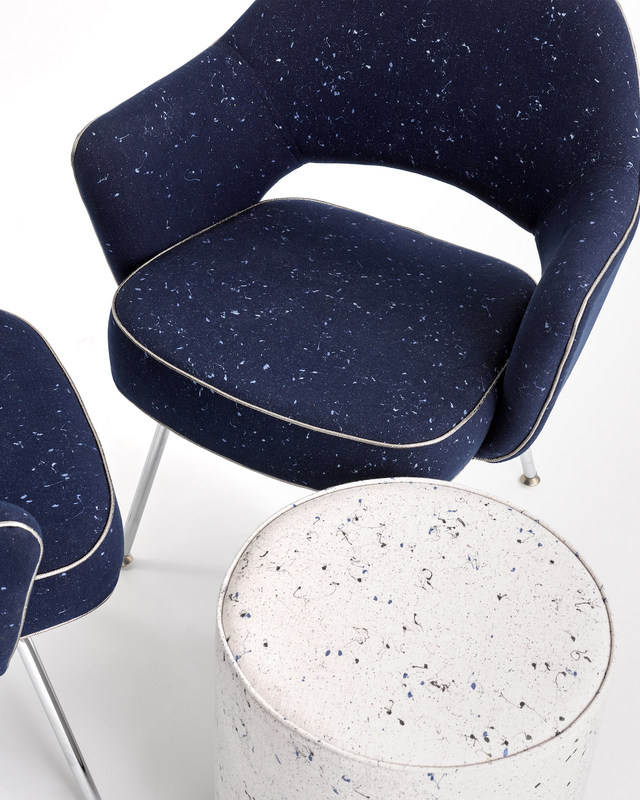 KnollTextiles is a member of The List, the destination for all things Surface-approved. Want to join The List? Contact our team to find out how to apply. On the occasion of Knoll Luxe’s tenth anniversary, can you reflect on some of the line’s achievements? I’m proud of the fact that the line has hit the ten-year mark. When we launched in 2008, the economy was really not going in the right direction and [there were questions] as to whether we should proceed with the concept of Luxe, which is taking ourselves up-brand. Knoll Luxe was intended to appeal to high-end residential, high end corporate and high-end hospitality. I am happy that Luxe is still alive and well in terms of being a brand within KnollTextiles in 2019. Any history or highlights to share regarding Knoll Luxe? What’s interesting about the history, I think, is that I sort of made it a point to have a fashion connection. Whether it’s how we researched collections for Luxe, myself with the design team, or working with fashion collaborators and from a historical point of view—and ironically, that goes back to Florence, because the first product that she brought into the line was men’s suiting to be upholstered onto furniture. At the time, upholstery for the contract market was chintz and cabbage roses. It was Florence’s vision to adapt men’s suiting, which she brought in from London, for the furniture line. 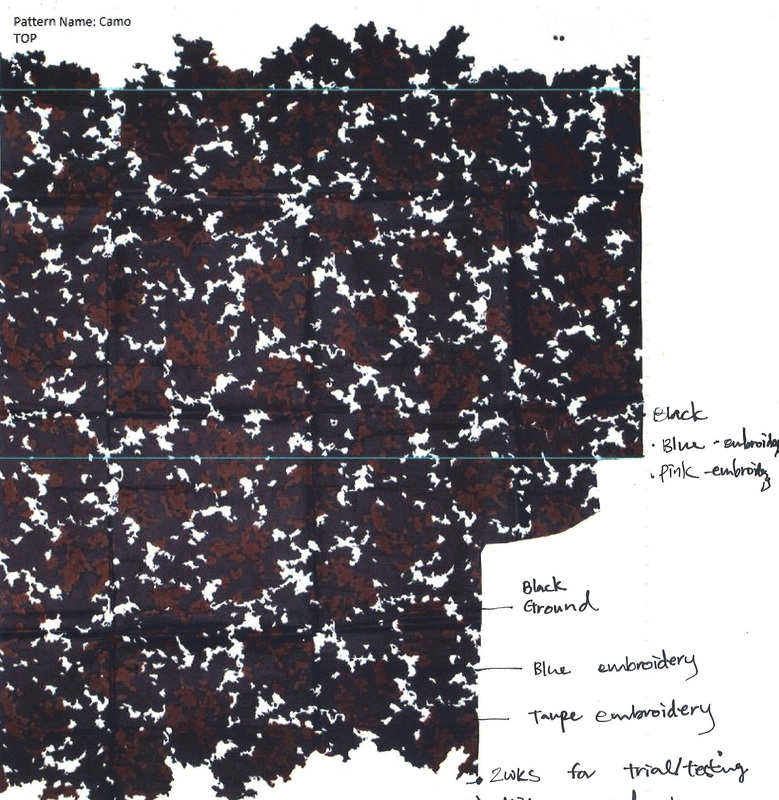 So, we’ve always had this sort of abstract connection to fashion through Florence as well as outside collaborators, which is another tradition that I continue with KnollTextiles. We have launched 12 Luxe collections since 2008; four of those were with designers and the other eight I designed myself with my team. That’s a perfect segue into my next question about the fashion collaborations. Perhaps using an explicit example, I’m wondering if you can tell us how those sort of collaborations come together. With the Rodarte collection, for example, the idea started when I saw their work in Women’s Wear Daily. I thought their point of view and philosophy of how they designed was appropriate for us to interpret into a Luxe collection. I do a lot of research when I think about a guest. What do they look like and what are they all about? Rodarte clearly understands not just cut and fit, but also color, texture and pattern. When I decided that I would like to pursue them for a collection, I had to get in touch with them, which was not easy. I was basically harassing them for lack of a better word. When I finally got a hold of them, they were not aware of who we were, so there was some education about Knoll’s history that needed to happen. Once we got over those initial hurdles, we were able to discuss how a collaboration would be a nice extension of their brand into new categories of drapery and upholstery. We moved forward to create, what I feel is, a very unique and thoughtful Luxe collection which translated their ideas into designs that felt equally Rodarte and Knoll Luxe. From beginning to end the collection took approximately eighteen months to design. Take me through the process of bringing Prince Hairy—one of my favorites from this collection—to life. So, Prince Hairy—and we named it prior to the Harry-and-Megan experience—is unique in how it’s finished. It’s done at a mill outside of Paris that we’ve worked with in the past. It’s a very simple pattern; we gave the mill all the color combinations. So that’s the one thing that we do here: we never let a mill create a color story for us. We receive all the yarns. We ask for colors to be placed into the palate for Knoll if necessary, if they’re lacking something. Most times we’ll ask for things to be added. 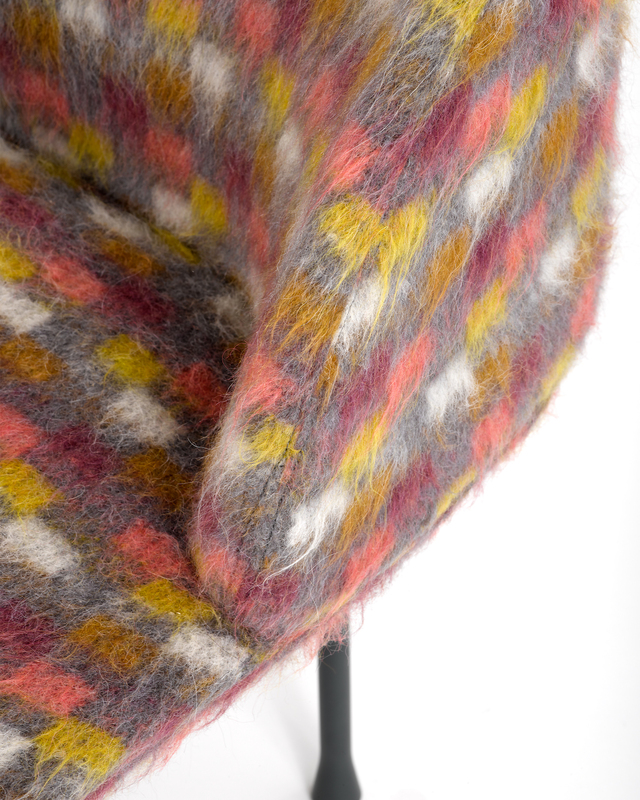 We put the color combinations together and then the mill weaves what is considered a pretty basic pattern. But it’s all about this yarn, and what we created was this novelty yarn of the different fibers—the mohair and the alpaca and the wool—all twisted together to create each color that you see here. And then they wash it with a natural soap and then brush it eight times. The brushing is obviously key, but the key part of the brushing is the consistency. So, here’s the mill; here’s the finisher in the same town. The finisher was working on his own timeline and everything he does is done by hand. I was like, “You’ve got to do this on time. You have no idea. I cannot be late.” But he finishes for Louis Vuitton, he finishes for Chanel, so, we’re going to a finisher that is French number one, which is fabulous, but two couldn’t be pushed in terms of time. He said, “I’ll get it done, but you’re going to have to let me do it my way.” He is, in turn, translating our vision. If you follow Prada at all, she had done this sort of embellishment of faux fur that’s very exaggerated. So again, our thought is always as follows: we see something, we research, and we translate that into an interior product. That’s always the challenge myself and the team put upon ourselves. How do we create something that’s not expected, that’s not necessarily out there yet, hopefully, or that easily lives at KnollTextiles or Knoll Luxe. I just love that in itself. So, this is what the mill gave us to start to think about the different color combinations to create World Piece. At first, we were like, “Let’s try this or this,” [by comparing color combinations on the blanket itself.] 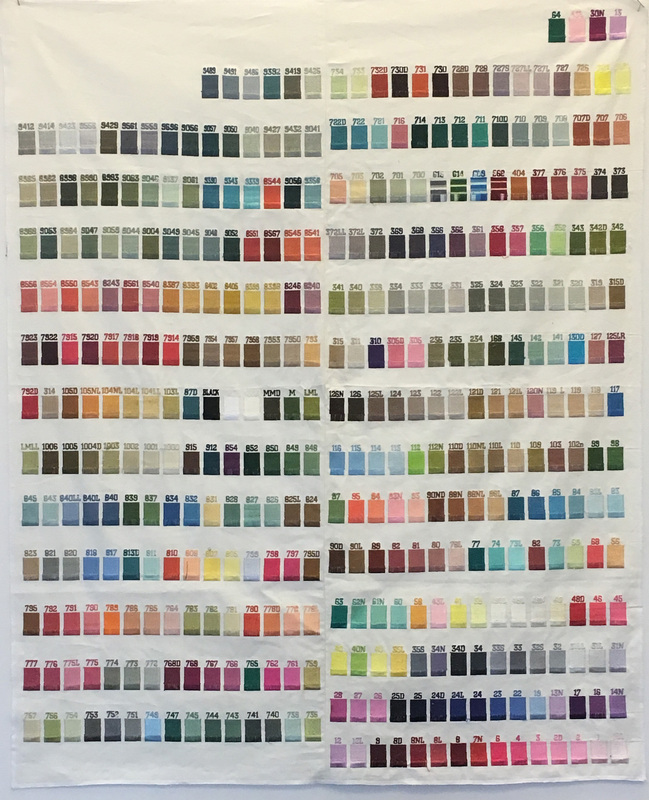 But then we realized why don’t we just get Pantone Chips to make our lives a little easier. It’s been responded to really well. [For World Piece we worked with] a small mill that we have grown close to that’s located in India. They sort of specialize in embroidery techniques. And believe it or not, World Piece also reached a large A for the Wyzenbeek Test, not sure heavy duty, but having the large A means that a corporate environment would accept this a lot more easily versus just residential. So that’s a big plus when it comes to having that. How long does it take from start to finish to develop a pattern? A good part of that process is also testing. Making sure it’s a valid product that can withstand Wyzenbeek and all of those tests that go on, durability, cleanability, all of that goes on in the process but when a project, a collection, or a product goes well it is 12 to 14 months. When it goes well. What specifically is tested? The durability? The strength? Each time we develop a new collection what’s challenging for myself, and my wonderful team, is we’re never allowed to repeat an idea. So even when it comes to solids and textures, each one of those has to be different than the last ones that we’ve done, even if it was 10 years ago, 15 years ago. We study everything and make sure that we’re not encroaching on an idea that is still alive and well on the line and then we always try to hear our sales force and what they’re telling us their needs are that perhaps we don’t have that’s living in our line. Then we try to create ideas that we feel will be appropriate, not only for today, but for the future. That’s how we process everything when we’re looking at new ideas and how do we feel inspired to create something that’s new and different. I’m wondering in which elements of Knoll Luxe is Florence’s influence most apparent? Florence was beautiful, smart, and driven. That element of always striving to push design just a little bit further than what was to be expected is still with us today. Again, while most of America was still working with cabbage roses and chintz and pink and green brocades, Florence Knoll introduced textural wool suiting as upholstery fabric. The need to be innovative and modern still drives us. I always say that we try to always live up to the name—Knoll—and not off of it. There’s a lot of work that goes on behind the scenes to make sure each product is something Florence would be proud of. I once had a client ask me, ‘What would Florence say about your work?’ It caught me off guard. It’s sort of like saying, “What would Jesus do?” It was that kind of moment where you say, “Would she approve of this language?” I think … I hope … for the most part that she would be pleased. I’ve had people ask me about Eclat Weave, designed by Anni Albers. 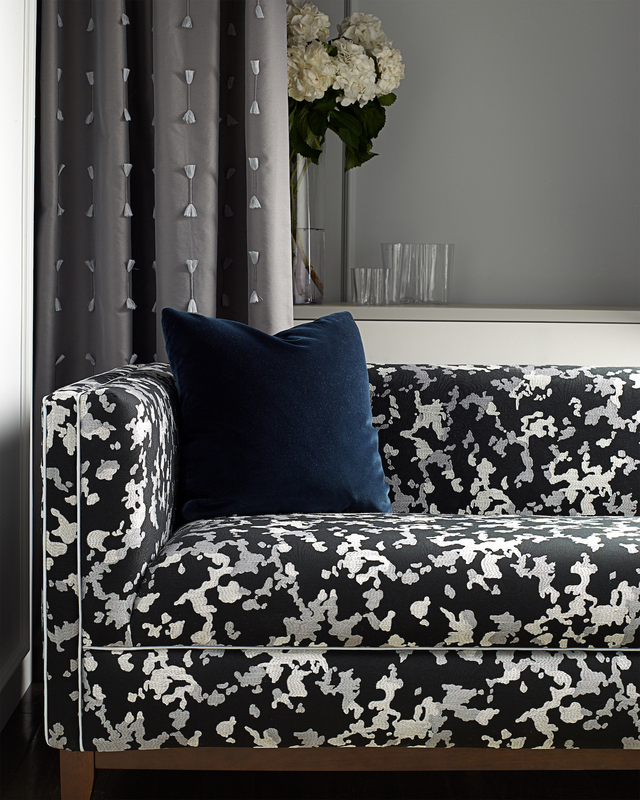 She first designed it as a print for Knoll as a guest designer, and we interpreted it into a woven upholstery in 2007. When I go out to clients, they’ll ask me if that was designed today or if I designed it. And I’m like, “No, actually it was designed in 1974.” But that tells you—that is a perfect, classic, timeless, modern design.